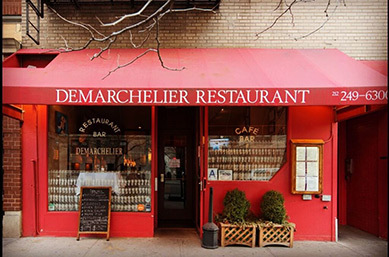 French-American artist and owner Eric Demarchelier opened his eponymous restaurant, Demarchelier Restaurant Bar in 1978. 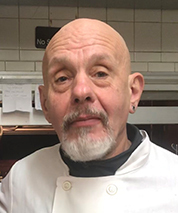 Talented Chef Marc Tagournet joined the restaurant 15 years ago bringing with him an impressive resume along with his set of well-honed knives. Luxury Experience had dinner at the restaurant located at the corner of 86th Street and Madison Avenue on the Upper East Side of New York City in late January 2019 and were notably impressed with the restaurant and Chef Marc. Chef Marc Tagournet graciously took time from the kitchen to speak with Luxury Experience about his culinary background. 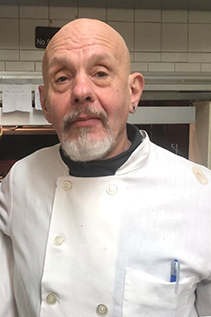 He attended culinary school in Vichy, France followed by an apprenticeship under Chef Pierrot Pinet at the restaurant, La Palice, then honed his skills as Executive Chef at the Nikko hotel in Taiwan. He later owned his own restaurant, called Restaurant 3 Marches, before joining Demarchelier Restaurant Bar. His passion for cooking began with his father, who was a chef. "Seeing the day to day hard work, dedication and love that being a chef gave him, and that his cooking gave others, inspired me." When asked what chef has had the most influence on his present culinary style, he replied, "Chef Paul Bocuse." Editor's note: Chef Paul Bocuse was a legendary 3-star Michelin French chef (February 1926 - January 2018) based in Lyon, France who changed the face of the culinary world with his innovative approach to cuisine. Best advice he ever received from a chef? "Never give up!" His advice to those interested in becoming a chef? "The same that was given to me, never give up. Also, work hard, have patience, and cook with your heart." What cooking tool would he never want to be without? "My knife." Although chefs have little time away from the kitchen, when asked how he spends his free time when not working at Demarchelier Restaurant Bar, Chef Marc Tagournet replied, "Cooking is one of my greatest passions and time spent in the kitchen crafting meals and recipes is always time well spent. But when I do step away, I practice Kung Fu." Chef Marc Tagournet graciously shares two delectable recipes to provide Luxury Experience readers a delectable "taste" of Demarchelier Restaurant Bar until you can personally visit the restaurant. Method: Combine butter, garlic, shallots, salt, pepper, and parsley until smooth. 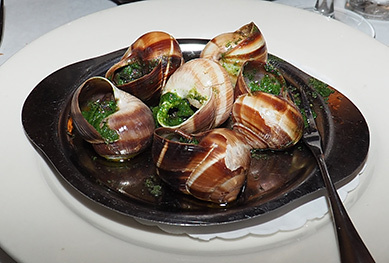 Fill escargots shells with garlic and herb butter and broil on high 5-10 minutes. Note: The restaurant serves 6 escargots to a portion. Method: In a large deep pan sauté garlic, shallots, thyme, butter, and salt and pepper. Add mussels to the pan and top with one cup of white wine. Cover and let steam until all mussels have opened. Finish off with fresh parsley. Demarchelier Restaurant Bar serves Lunch Monday through Friday 11:30 am until 4:00 pm, Brunch on Saturday and Sunday from 11:30 am until 4:00 pm, and Dinner daily from 4:00 pm until 10:00pm. In addition to the à lacarte menu, the restaurant offers a prix-fix dinner menu, and an Express Lunch Menu for those on the go. 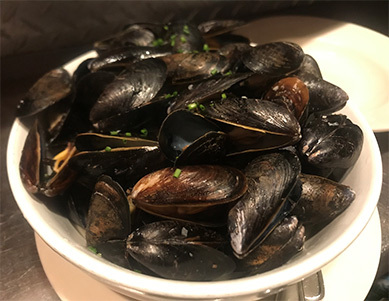 The restaurant also has weekly specials: Tuesday features Couscous, on Wednesday there is Duckà L'Orange, Thursday features Cassoulet, on Friday there is Bouillabaisse, and Saturday features Pot au Feu. 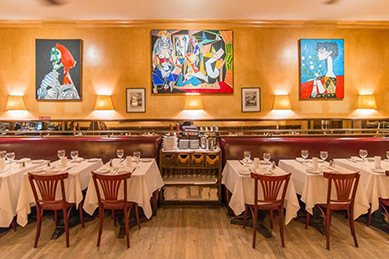 With its proximity to the Neue Galerie (1048 Fifth Avenue at 86th Street) and the Solomon R. Guggenheim Museum (1071 Fifth Avenue at 89th Street), Demarchelier Restaurant is perfect for a pre or post-museum lunch or dinner. Read about our dining experience at Demarchelier Restaurant Bar in the Restaurants section.